Cotswold Archaeology provides a full range of archaeological services. 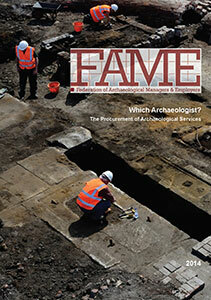 Find out more about our Archaeological Consultancy, Historic Buildings and Historic Landscape services. At Cotswold Archaeology, post-excavation work includes everything that happens to the records, digital data, artefacts and samples recovered from a site once the process of excavation has taken place. 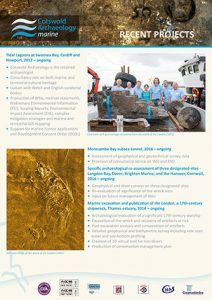 Find out more about our Finds & Environmental, Illustration & Photography and Post-Excavation and Archive Services. Cotswold Archaeology provides a full range of fieldwork services across the UK, with teams based at each of our offices in Andover, Cirencester, Exeter, Milton Keynes and Suffolk. Find out more about our Evaluation, Mitigation and Survey services. 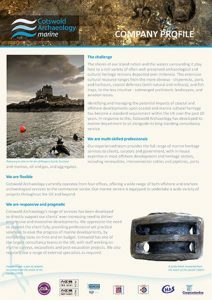 Cotswold Archaeology provides the full range of Marine heritage consultancy services to clients, curators and government, with in-house experience of working for most of the offshore development and heritage sectors. Find out more about our Marine Services.